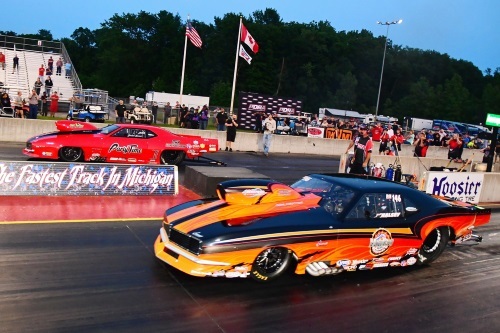 MARTIN, Mich. (June 3, 2018) – Past Pro Nitrous world champion Jason Harris broke a long winless streak Saturday night when he drove the “Party Time” ’69 Camaro to a meaningful final-round win at the Professional Drag Racers Association (PDRA) Summer Drags at US 131 Motorsports Park. 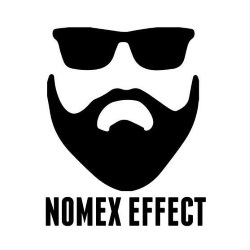 Pro Nitrous driver Scott Blake, who experienced a violent on-track incident during Friday qualifying, was released from an area hospital Saturday and briefly returned to the track before going home to Red Deer, AB, Can. to continue his recovery. 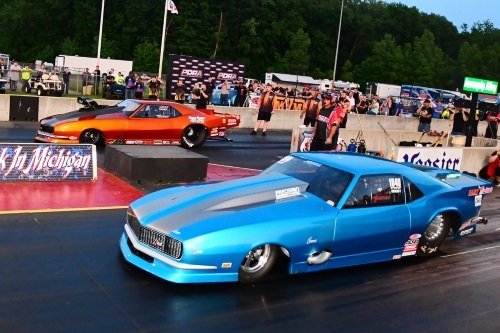 After winning six of eight final rounds and securing the 2014 Switzer Dynamics Pro Nitrous presented by MoTeC world championship in the PDRA’s inaugural season, Jason Harris has struggled to return to the winner’s circle in the Boone-Harris Racing ’69 Camaro. Harris earned the final-round win on the starting line, using a substantial holeshot advantage and 3.724-second pass at 201.52 mph to defeat No. 2 qualifier Jim Halsey’s 3.674 at 205.39. Appearing in his third Pro Boost final round in as many races, Chuck Ulsch was due for a win in his Roots-blown ’68 Camaro. 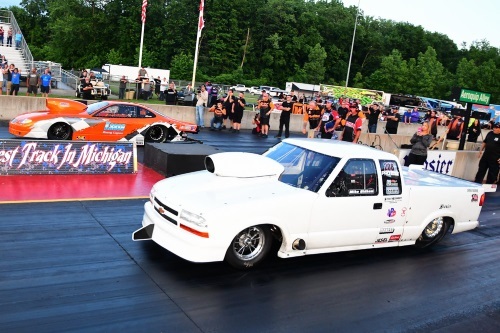 The former Outlaw 10.5 star earned his way to the final round with a string of progressively quicker 3.7-second passes, but a lucky break helped him secure his first PDRA 660 Man trophy. Final-round opponent Andy Jensen crept through the staging beams before the tree activated, then Ulsch went into tire shake shortly after his side of the tree dropped. He lit up the scoreboard with a 4.977 at 101.03. Terry “Legbone” Leggett, racing as the No. 1 qualifier for the second consecutive race, was surprised when his screw-blown ’71 Mustang lost traction on his first-round competition bye run. Leggett came back for the final round and improved to a 3.568 at 216.03, defeating a red-lighting Adam Flamholc and his 3.650 at 210.38. After qualifying No. 1 at Maryland last month and at Martin Friday night, John DeFlorian Jr. was ready to finally string together enough quick passes to end up in the winner’s circle. 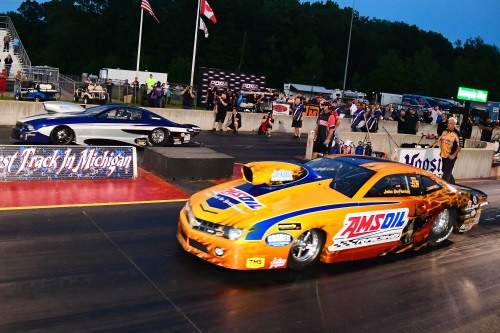 A past winner in IHRA, ADRL and XDRL competition, DeFlorian earned his first PDRA Extreme Pro Stock victory when he drove his Amsoil ’16 Camaro to a 4.07 at 177.10 in the final round. His opponent, 2016 event and world champion John Pluchino, negated his 4.093 at 176.33 when he red-lighted. Incredibly, all of DeFlorian’s opponents left too soon and decided the race on the starting line. However, DeFlorian was ready with superior passes: 4.111 next to Chris Powers’ 4.179 and 4.110 next to John Montecalvo’s 4.111. Pluchino’s New York-based ’13 Mustang recorded nearly identical 4.11s over Elijah Morton and J.R. Carr before the final. 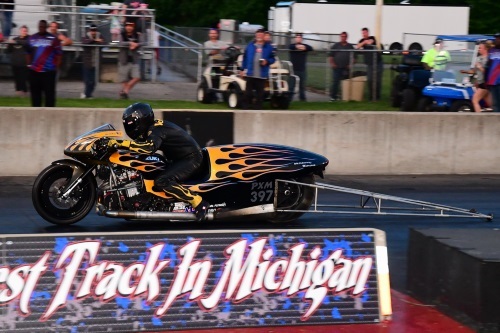 Three-time PDRA Pro Extreme Motorcycle world champion Eric McKinney was set to run his tuner and teammate, Ashley Owens, in the final round, but a potential costly engine issue prevented Owens from bringing his motorcycle to the staging lanes. McKinney, the No. 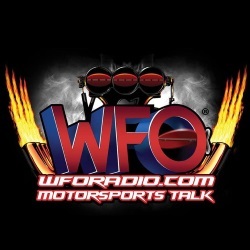 8 qualifier, took advantage of the free pass and fired off a 3.994 at 178.36 to gather data. McKinney scored a holeshot victory over first-time No. 1 qualifier Ehren Litten in a 4.08-to-4.05 first-round race, then defeated Chris Garner-Jones’s 4.056 with a 4.029. On the other side of the ladder, Owens rode his McKinney Motorsports Suzuki to round wins over Brunson Grothus and Ronnie “Pro Mod” Smith. Mike Oldham wasn’t the quickest Pro Outlaw 632 driver in qualifying, but his Tom Jarvis-owned ’05 Chevy S10 was the class of the field throughout eliminations. He used the second-quickest pass of the weekend, a 4.23 at 167.66, in the final round to overcome the .009 reaction time by Johnny Pluchino, who ran 4.293 at 165.75 in the runner-up effort. Oldham started eliminations from the No. 5 spot and went 4.247 to defeat Walter Lannigan Jr. in the opening round. He fired off low elapsed time of the weekend, 4.223, next to a red-lighting Dillon Voss in the semifinals. Meanwhile, Pluchino used a pair of 4.30-second passes to defeat Daryl Hameetman and Matthew Buck on the way to the final round. 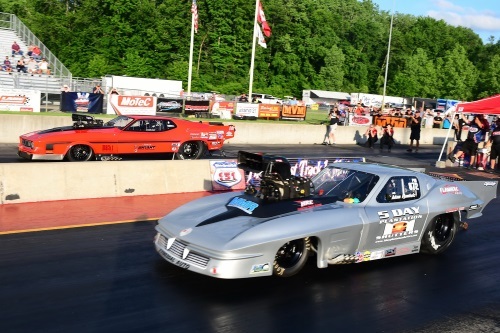 A pair of Virginia natives squared off in the Elite Top Sportsman final round, as Herndon’s Glen Teets III drove his ’08 Pontiac GTO to a 4.217 on his 4.21 dial-in. The win was his at the starting line, though, since Quinton’s Henry Underwood left .021 too soon in his ’68 Camaro. Dennis Gaboriault, the Top Sportsman 32 runner-up at Maryland, redeemed himself when he turned on the final-round win light over Luc Angers. The Elite Top Dragster final round featured a battle between boosted dragsters. Al Peavler and his ProCharger-equipped entry ran 3.886 on a 3.88 dial-in to take the 660 Man trophy back to Olney, Ill. Camrie Caruso, daughter of Pro Boost driver Marc Caruso, broke out by just .008 in her supercharged dragster. 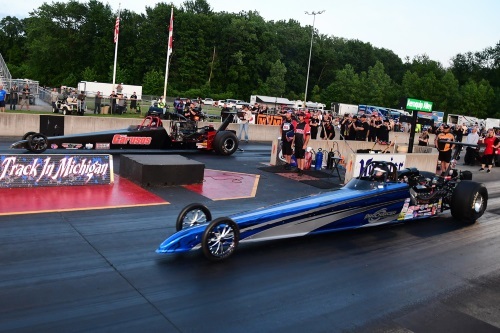 Nick Reavis denied Michigan’s own Bill Swain in the Top Dragster 32 final round. 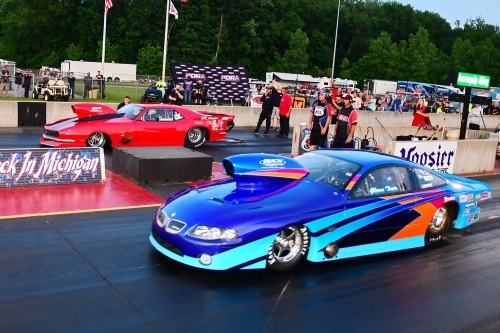 The next stop on the PDRA 2018 tour is the PDRA Firecracker Nationals, June 28-30, at Virginia Motorsports Park in Dinwiddie, Virginia.